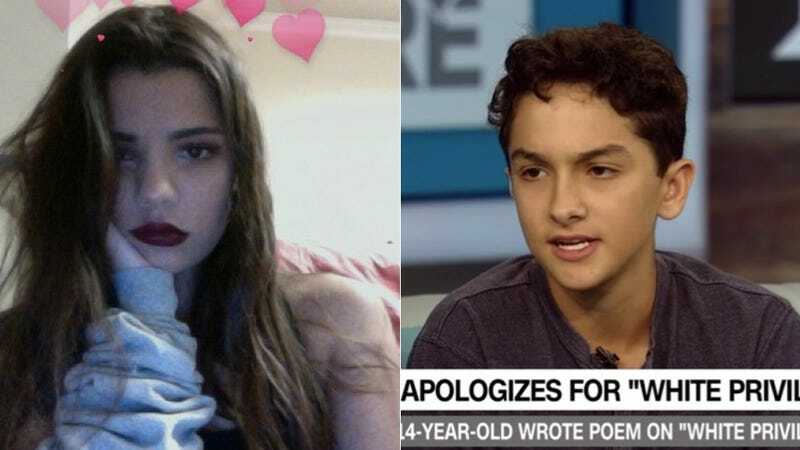 Two notably enlightened teens captured the world’s interest this week, one through the barely tolerable medium of spoken word and the other through a weird Paper Magazine apology. Royce Mann is a 14-year-old from Atlanta who recited a poem called “White Girl Privilege” that won her first place in her school’s poetry competition in May. She’s a teen whose empathetic perspective on race relations, privilege and Black Lives Matter got her crowned the wokest of them all—almost overshadowing the fact that these ideas merely make her a decent young human with logical world views who probably has minority friends. And yet we must acknowledge that at the age of 14, Mann has managed to grasp the basic concept of white privilege and racial constructs in ways that befuddle people twice her age. She’s a likable teen Macklemore of sorts. Mann says she learned the racist, sexist ways of the world while taking a Race, Class and Gender course at her new school, The Paideia School. Her message has naturally attracted racist trolls, but mostly she’s been praised for its refreshing level of enlightenment. She really made us think. Segue: Teens are so prevalent that Mann wasn’t the only one who impacted social media this week. Alexis Isabel Moncada is the 17-year-old founder of Masculist Culture who Paper profiled in its tragically titled “Yass Teen” series. After publishing the interview and celebrating Moncada for his leadership, however, the mag issued an apology and a Note From the Editors that cited questionable behavior from when Moncada was 14. A formal apology that brings more attention to a teen screw-up wasn’t needed. Their oversight could’ve been addressed through a follow-up interview or by simply adding Moncada’s statement as an update to let his speak for himself. It really makes you think, though, how much this is a testament to the social era of living in which young, dumb, irreversible mistakes become fodder for rote mass disciplining. Teens are inspiring in that way.